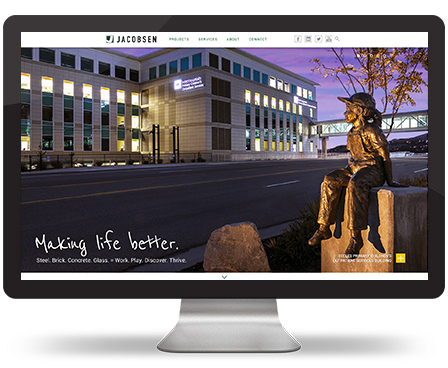 When we were approached by Jacobsen Construction to design a website for them, we didn’t know they were an employee-owned company. We soon learned that there was no CEO dictating details, but rather a team of professionals, including a writer, a designer and a biz dev expert. We worked together, incorporating big photos, vertical parallax scrolling, and video to communicate the yield behind Jacobsen’s famous formula: prosperity and value for their customers. From luxury condominiums to religious temples, the projects section of their site shows off work they’ve completed throughout the entire country.